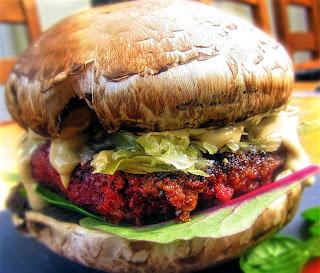 A delicious soy-free whole food alternative to the usual vegan burger; a sweet and salty beet burger made from a combination of whole-food healthy ingredients including beetroot, oats, walnut and sun-dried tomatoes whizzed together in a food processor for a quick and easy homemade patty. I put mine between a “portobello bun” and topped my burger with a mixture of tomatoes, sauerkraut and tahini. -Measure out all the burger patty ingredients and place into a food processor. Pulse the mixture until all the ingredients are combined and smooth. -Separate the mixture into four and using your hands form a burger shaped patty before placing the burgers on a plate, covering with clingfilm and allowing it chill in the fridge for 30 mins-1 hour. – Once the burgers have chilled you can take them out of the fridge and begin heating a tablespoon of argon oil in a large frying pan. Ensuring you leave at least a cm circumference around each patty place them in the frying pan and cook on a medium heat for 3-4 mins or until the base is golden and crisp. Turn the over and cook for a further 3 mins on the other side. -I enjoy these burgers sandwiched between a grilled mushroom bun as it is a surprisingly tasty and satisfying alternative to bread. To prepare the mushrooms simply place under a grill for 3-4mins. -To make the tahini dressing whisk the tahini and lemon juice together using a fork in a small bowl or cup adding salt and pepper to taste. – You can now begin to assemble your burger, I like to start by putting a patty directly onto the upward facing mushroom. Then I add a handful of leaves, some sauerkraut, sliced shallots and tomatoes and finally the tahini dressing before placing the other mushroom on the top to complete your burger.